This is the city where your touristic aspirations will bloom and grow, where you’ll meet some amazing culture, where you’ll find excitement and ave, and awake the spiritual self. 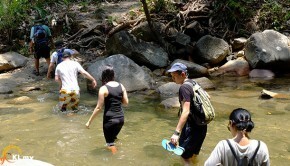 There are hundreds of tourist attractions, with Heritage Nature Park one of the most popular ones. 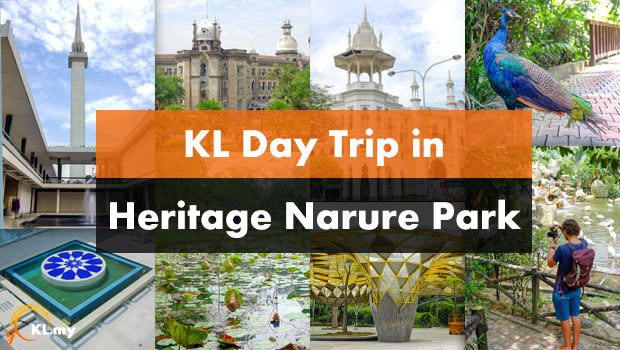 Today I will make one Kuala Lumpur day trip closer to you, by showing you how great time I had visiting magnificent Hertage Nature Park. This day trip includes several locations, added to the map. Left Metro Hotel and took KTM train from KL Sentral to Kuala Lumpur station. 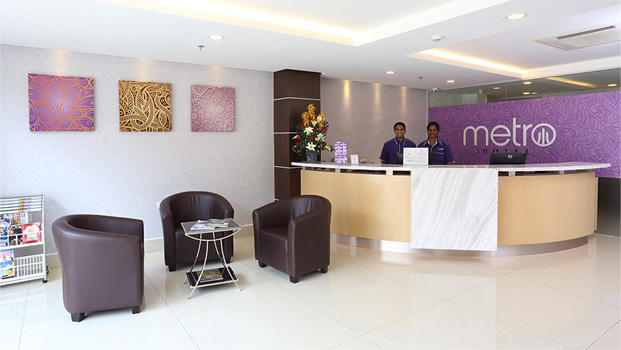 For this KL day trip planned out, I was staying in Metro Hotel. It is located within KL Sentral, the major transport hub where KTM, LRT, Monorail, KLIA Express and bus interchange are interconnected. It’s a real pleasure staying in there. 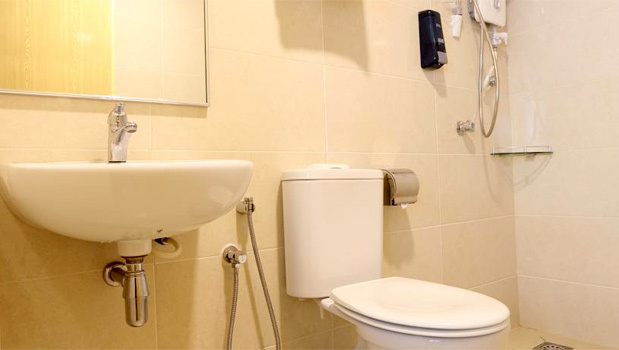 Tastefully furnished, it provides visitos well rounded service at reasonable prices. I got up around 8:30am and got ready for my exploration day tour. At 9:20am I left Metro Hotel, walked towards KL Sentral shopping mall and took KTM train from KL Sentral to Kuala Lumpur Station, as it was close to my first destination. I arrived pretty fast at the big station, looking very clean and built in colonial style. Round passages and windows everywhere showing many passages sections of the station. You couldn’t arrive and not notice the amazing Malayan Railways Limited Building. A mixture of British architectural and local building style, this astonishing construction will inspire admiration in traveler’s eyes, no matter if you’re fan of architecture or not. This building serves as main railway operator in Malaysia. With extraordinary façade which allures you to explore. The entrance is free, even though there are some restricted areas inside. 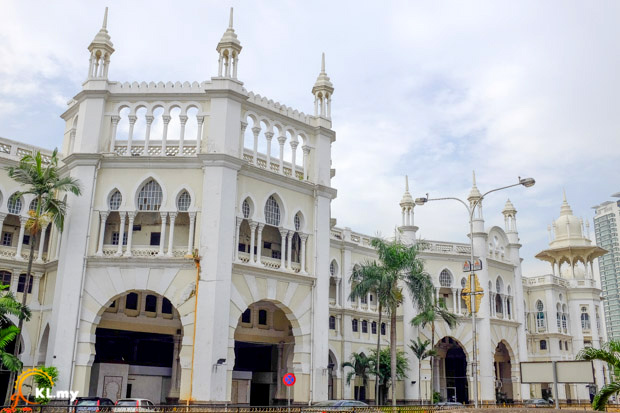 If you’re an exploring type, while visiting KL you should not miss this fine-looking historical building, even though it is not listed as a tourist attraction in guides. Get your camera ready, as you can capture many interesting and good looking areas here. And while you’re here, you couldn’t help to notice the Administration Building across. This colossal construction was renewed several times since opening in 1910. 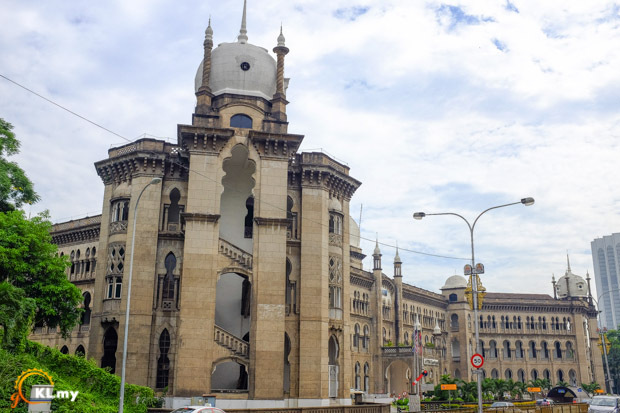 Wide, and with hundreds of big windows with arches on top, the Administration Building resonates Eastern design in resemblance with Sultan Abdul Samad Building. 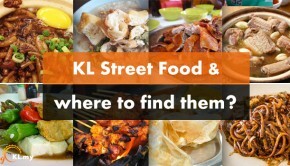 Located in Victory Avenue, it is close to the National Mosque and The Majestic Hotel. The interior of main hall serves as a museum of railway objects and historical platforms during house exhibits. After some lovely pictures taken, and some nice time, I moved on feeling content to have the opportunity to explore this historical monuments of KL. Next stop in this travel day was National Mosque (Masjid Negara in Malay). This one is truly an ave-inspiring construction. 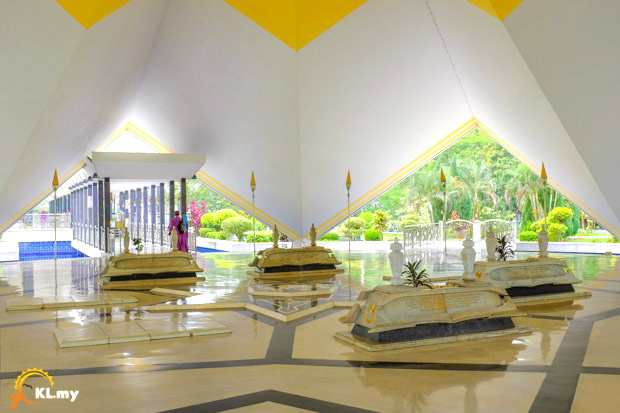 The immense structure is designed beautifully for the worshippers to come and rest spiritually and emotionally as well as physically, and pray. National Mosque can host 15,000 people and it is situated among 13 acres of picturesque gardens, monumental buildings, amazing fountains, and well designed green fields with beautiful plants, trees and flowers. Built in 1965, the mosque represented symbolic aspirations of then newly independent Malaysia. Being here is simply amazing. Observing the people in the calm nirvana state, looking at the gardens, the gorgeous fountains and amazing architectual wonders done here in National Mosque, one can truly find inner calm and prosperity. Luckily, tourists are able to take photos of the interior, but we had access only to certain premises, since that is the rule for the non-muslim people. Amazing structures and vast green gardens decorated with astounding fountains are most certainly the highlight of this KL day trip, no questions asked. Great Heroes mausoleum is an exquisite place with perfectly preserved tombs of the historical heroes who suffered for Malaysia, so the future generations can have freedom and prosper they didn’t have. For most tourists, it usually takes less than an hour to explore the mosque. For this trip to KL iconic attraction with photo taking, I stayed about one and half hour. The itinerary lead me to my next destination: Islamic Arts Museum. 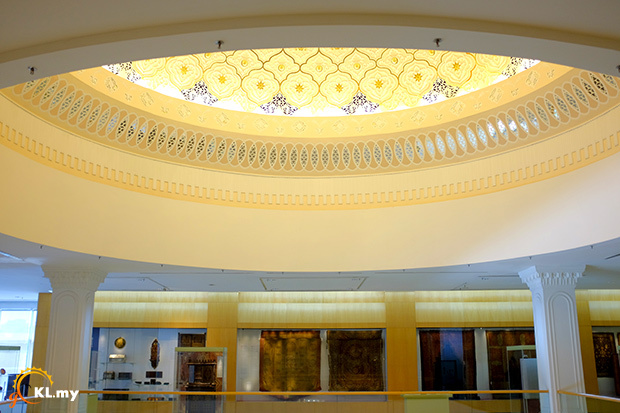 Officially opened in 1998, this museum features Islamic art and culture gallery in the 4-storey building. 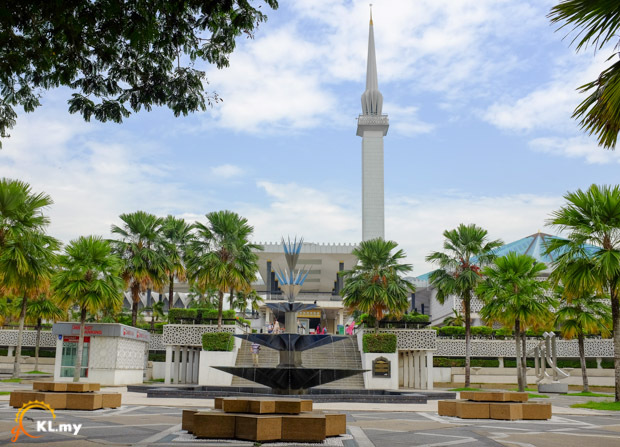 Only 3 minutes of walk from National Mosque, Bird Park, and National Planetarium, the museum attract hundreds, if not thousands of tourists every day. Islamic architecture design shines here the most in the whole Southeast Asia. Both Interior and exterior of the museum show Islamic wonderful style of building and constructioning pieces of art, with marble, colorful walls, high glow, and vivid contrasts. Here you can visit and admire the assembly of the Islamic world’s most significant buildings. 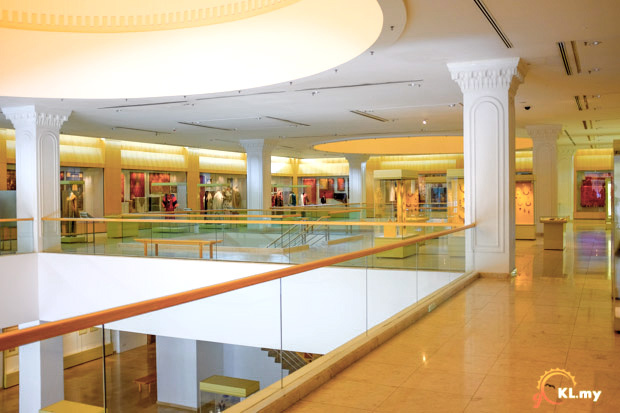 With 12 main galleries, classified by the types of artefact they contain, the museum is divided by levels. 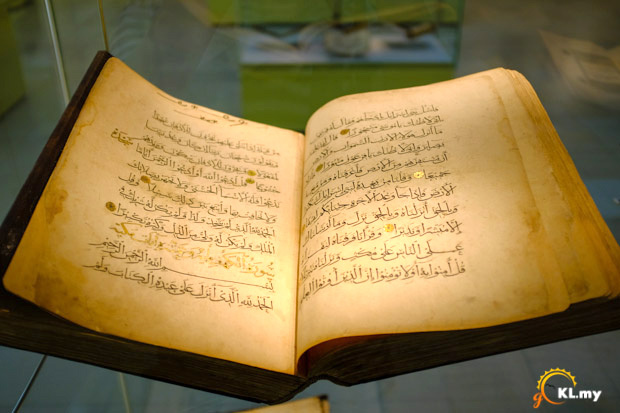 I was totally impressed with Quran, Manuscripts and Architecture gallery. They show the roots of Islamic culture and pride through the centuries. There are many more to discover and explore, as those are accompanied with Ancient Malay World Gallery, Ottoman Syrian Room and more. This place holds so many relics and artefacts that it self deserves a whole article about it. I really enjoyed here, time flew by really fast, and I didn’t managed to explore everything here, since the Museum is so huge, because my belly reminded me that I haven’t eaten since breakfast. The time was for lunch, and the planned destination was Hornbill Restaurant. My KL day trip continued for the Hornbill Restaurant, rustic construction surrounded with rainforests of Hornbill Park. 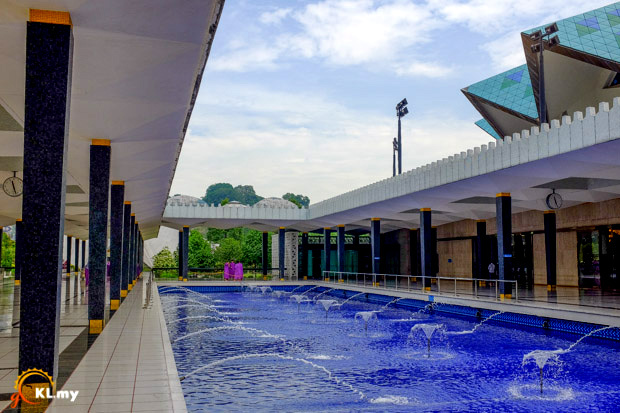 Natural surroundings blend with modern ambience providing a lovely dining experience for the hungry travelers who are enjoying the daily trips around the park visiting magnificent attractions of Kuala Lumpur. 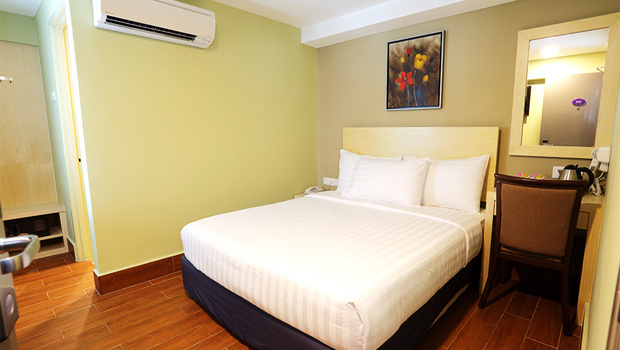 Lots of lush environment gives the warm and cozy feeling, and gives one leisure while eating and staying here. I had Chicken Chop – A Bird Park Special; recommendation from a waiter, and I was satisfied as the food was delicious, and portion size pretty big. One can eat well at Hornbill Restaurant, for sure. In combination of calm surrounding, and lush environment, it is a splendid experience. Restaurant has 3 levels, and we went on the highest one, so we could enjoy the great view of the Bird Park KL. My honest recommendation for this place, if you’re near here anytime in your KL holiday, be sure to visit Hornbill Restaurant. After a fine rest and tasty meal, the Bird Park was a logical choice. 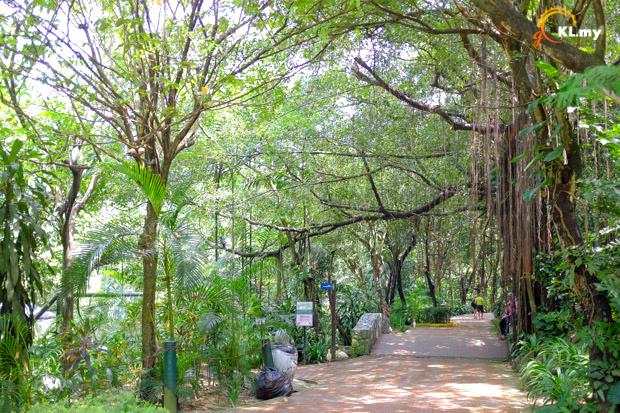 With 3000 birds here, the park is a home for around 200 species of exotic birds to observe. In 20 acres of public aviary, this popular tourist attraction is a part of 150-acre Lake Gardens, established in 1888. 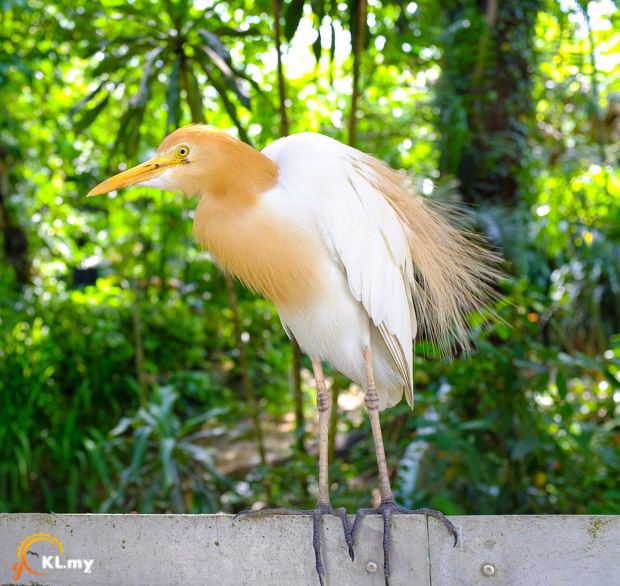 Rich flora and fauna gives visitors exquisite encounter witnessing some of the rare birds from Malaysia (or imported, 10% of them) in their natural habitat. Possibility for seeing birds this close is amusing, and unique experience. You can see some rare species here, and because it’s a wide and really big area, hundreds of places can be found and enjoyed on. My group was exploring with cameras, and found some flamingos chilling out by the small pond. A group just stood there, like there are no dozens of humans looking at them, behaving naturally. Remarkable. Worth mentioning were scarlet ibis, who stood out and spread his wings victoriously. 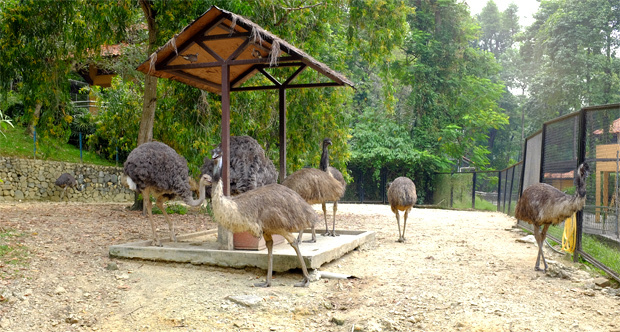 A beautiful sight, like many others you will embark on KL day visit to the Bird Park. Funny thing about exploring this KL attraction, time simply flies by when you’re here. Many interesting stuff here gets you amused and entertained, that you simply forget about time. My stay at Bird Park was a bit more extended, because I was determined to see the famous hornbills, which were bit tougher to find, since their pack was on the move. Luckily, they eventually showed up. Two hours later, next stop was Laman Perdana Botanical Garden in Heritage Park of Kuala Lumpur. Green lush land with lots of trees spreads over 100 acres, containing amazing Petal-Shaped Shelter, a charming Perdana Lake, and several decking built for visitors to admire and photograph stunning panoramas. The Perdana Lake is dazzling. I enjoyed just observing it, watching the perfectly still water, no waves at all. There are benches all over, comfy spots for rest and enjoyment. People taking care about the garden made lots of trees looking amazing by trimming and shaping them into wonderful shapes. When I saw some people driving Segways, I knew I had to rent one and do that too. This ride made me so content, and joyful, as I was riding through huge garden with ease and elegance; simply marvellous experience. I managed to find a small, and a bit private area where I had a small meditation session as well. The calmness, the surrounding, was simply perfect. Holidaying in Kuala Lumpur, enjoying at one of the most beautiful botanical gardens in Malaysia, and having the blessing of exploring these beautiful places is wonderful. Happiness and content overflow is a common reaction here, as the people find inner calm and nature connection with this place so easily. I recommend visiting this beautiful place, and seeing it for yourself, as the words are not enough for describing the feeling when you’re actually here. This KL day trip brought out the inner happiness in me, and crowning it with Perdana Botanical Garden was the best decision, as it made me feel special and wonderful.